Dial your flower arrangements up a notch! This fiery collection includes a variety of summer bulbs that just so happen to combine beautifully in orange hues reminiscent of a fiery sunset. 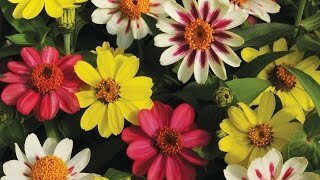 Included are two tubers of dahlia ‘Berliner Orange,’ a semi-dwarf variety that can be grown for cuts or in containers, five gladioli, two callas, and five crocosmia. Be bold and experiment, and be rewarded with fun, cheerful bouquets all summer long. Dahlia may be grown from seed sown early indoors and transplanted outside after frost, or sown directly in the garden after frost, or grown from potted plants or tubers. Sow indoors 8 weeks before last frost using a seed starting kit. Direct sow after danger of frost has passed. Select a location in full sun with good rich moist organic soil. The more sun dahlias receive, the more flowers you will get. In hot climates, a bit of shade during the hottest part of the day will protect plants from heat, however. Sow seed ¼ inch deep. Seedlings emerge in 14-20 days. Thin plants to 18-30 inches apart, depending on the variety, when seedlings are 1 inch high. Plant tubers when you receive them in spring. Dig a hole six inches deep and wide enough to accommodate the tuber. Place the whole dahlia on its side (do not cut up dahlia tubers). Cover with 2 inches of soil. As the plant grows fill in the hole until it is even with the rest of the garden. For larger varieties inset the stake you will use to support them the same time you plant the tuber to avoid damaging the roots. Deadhead regularly to keep plants blooming. In the north just after frost kills the foliage, cut back the foliage, dig up the clumps, remove the soil and allow to dry for at least an hour. Do not wash roots. Store them over the winter in paper bags filled with slightly moistened vermiculite in a cool but frost free, well-ventilated location. Check throughout the winter that they do not dry out. For larger flowers do not divide root clumps. When flowering ceases in Zone 8 and south, cut the plants to 6 inches and mulch them. Dig and divide clumps every two to three years to keep them vigorous. Compact bedding dahlias are ideal for container gardens and for edging beds. Use the border types to add height and color to gardens in late summer to fall. Dahlias also make beautiful cut flowers. Gardeners who wish for fewer but larger flowers should disbud their plants.